Check in as a stranger; check out as a friend. All different kinds of families are welcome! Casa Hamaca Guesthouse is not just a hotel, it is my home. I live there. My name is Denis Larsen and I invite you to be my house guest. Casa Hamaca has only eight guest rooms so your experience is very personal. You are treated as a personal friend, not just a room number. 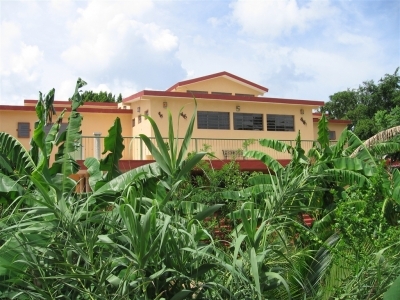 Casa Hamaca Guesthouse in the Pueblo Magico of Valladolid, Yucatan, is ideal for independent travelers and small groups. It's your home away from home if you are searching for a central location from which to explore the entire Yucatan. Valladolid celebrated its 470 birthday in May, 2013, as a Spanish Colonial city. And many more years as the pre-hispanic Mayan city of Zaci. Come join us for the year-around fiestas. I have been traveling to the cities and small villages of Yucatan for about 16 years and am happy to share my experiences and recommendations with you. I have a deep love for the Mayan people... their culture, their food, their heritage and their language. All of the staff of Casa Hamaca are Mayan. They all speak Yucatec Mayan. They all live in small villages surrounding Valladolid and all commute 1,000 years to work every day. Most live in traditional, thatched-roof huts, cook on the floor with fire and sleep in hammocks. They live much the way their ancestors did a thousand years ago. Most of them speak Spanish as a second language; a few speak a little English. But all of them go out of their way to make your visit to Casa Hamaca comfortable, interesting and educational. Casa Hamaca Guesthouse melds indigenous artifacts and images with an extraordinary lush, natural garden. There truly are Fifty Shades of Green in the jungle garden. Why should you even consider coming to Valladolid in the first place? * Valladolid is not a one night stand or just a rest stop on the way to or from Chichen Itza. It is a city rich in history and culture, located smack-dab in the middle of the Yucatan and the Mayan world. * Valladolid is the nearest colonial city from Cancun. The city is 470 years old (in 2013) but still has a small-town ambiance. Valladolid is built on the Mayan site of Zaci so the city is actually much older than 470 years. has a long and colorful history. * There are 3 major Mayan ruins, open to the public, less than a one hour drive from Valladolid: Chichen Itza, Ek Balam and Coba. Plus many more within a two hour drive. straight north from Valladolid about 1 1/2 hours. soft-sand beaches, about one hour and ten minutes from Valladolid. * There are cenotes (fresh-water sinkholes) in every direction. Many are open to the public for swimming. There are (depending upon whose figures you use) between 3,000 and 6,000 cenotes in the Yucatan. * Valladolid is located less than 15 miles from Xo-Cen (the Bellybutton of the World according to Mayan belief). Many old Mayan traditions are still practiced in the small villages of the Yucatan. * Valladolid is a cultural city in its own right. From the museum-quality collection of Mexican folk art at Casa de los Venados, to the frequent musical presentations in all of the parks, to art and photography exhibitions at City Hall, to the parades, fiestas and dances there seems to be something happening every week. * There is a wide variety of food options in Valladolid from street corner push-carts (we'll tell you which ones we enjoy) to locals-only family restaurants away from the main square to white linen dining. And everything in between. * Valladolid is one of the safest cities in the state of Yucatan which is the safest state in Mexico. The crime rate for the entire state is about equal to the crime rate of the state of Vermont in the USA. You do not need to worry about getting knocked over the head while walking around in the evening... you do , however, need to watch where you put your feet as you walk since some of the sidewalks are very narrow and have ramps, steps and holes that can trip you up if you are not paying attention. Because of Valladolid's central location on the Yucatan peninsula, there are easy day-trips in every direction to ancient Mayan ruins, colonial churches, sleepy fishing villages, swimming with whales, horseback riding, bull fights, salt-water fly fishing, caving, freshwater cenotes, traditional Mayan villages, cave diving, deep sea fishing, museums, distilleries, chocolate fabricators, Caribbean snorkeling, water tours of natural preserves, sunken Spanish galleons, high fashion designers and showrooms, rodeos (charros), shamanic cleansings, outdoor theater and more. Almost hidden iguanna right in the center. Chile max: looks mild but is very picante! All rooms have AC, ceiling fans, screened windows, original wall mural, authentic Mayan hammock, en suite bath with walk-in shower with pressurized hot water, WiFi. 19 % tax not included. Full breakfasts, WiFi, and on-site parking included. The owner advises that a car is not required for this location. Valladolid is central-located in the Yucatan peninsula allowing visitors the opportunity to take numerous day-trips in any direction to explore Mayan ruins, sleepy fishing villages, colonial churches, fresh-water cenotes, natural preserves, traditional Mayan villages and more. Transportation by bus, van or taxi is available to just about anywhere you might want to go, but having a rental car frees you from a schedule.